Did you know we cannot live without bees, so we should encourage them into our gardens.There are 270 species of bee of which 35 are under the threat of extinction. The honey bee is the most popular, but I do not know the type of these two, I never understood all that talk about the birds and the bees, and I am too old now to start learning. However I much prefer bees to flies in a photograph. 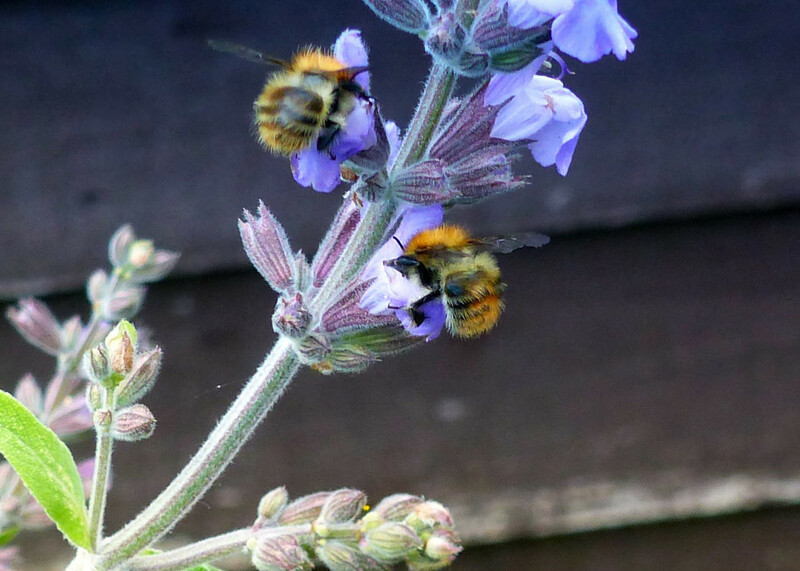 lovely photo of the bees,nice shot. True. Bees are a necessity- even if I am nervous of them. Fav! @gaylewood You talk for yourself young lady. @annika82 These two are playing around my broad beans, so I am expecting a heavy crop later on. This is lovely Pete. Absolutely sings on black and an instant fav. Great capture of these two bees, excellent! @peterday Oh well done. It deserves to be there - you have an excellent photo there. Hope it's going to be framed. Buzzy Buzzy Bees! Nice capture! Super close up, they look very furry, our Australian bees are totally different to this. Superb picture. Your work is brilliant recently! @janemartin That's because I have you on my tail. Fantastic shot, I’ve even been saving bees from spider webs to help the cause!